Rivers State Governor, Nyesom Ezenwo Wike has declared that only civil servants with proven Bank Verification Numbers, BVN, will receive salaries beginning February as the State Government moves to determine the actual number of staff in the employment of the state. Also, Governor Wike has approved the commencement of the setting up of the College of Medicine and Teaching Hospital at the Rivers State University of Science and Technology, RSUST. 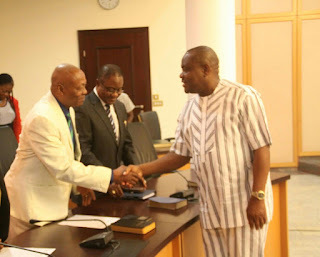 Technology, RSUST paid him a courtesy call , Governor Wike said that the monthly wage bill of the state government stands at N7billion while the monthly pension bill stands at N1.4 billion. He said : “This month, if you don’t submit your BVN and physically identify yourself, you will not be paid . If only 20 staff have their BVN verified physically, they will be the only staff to be paid. The governor also announced that the State Government will no longer pay the salaries of primary and secondary school teachers of Demonstration Schools of RSUST and other designated tertiary institutions where pupils and students pay school fees. He added that the State Government has completed the payment of salary arrears of recalled lecturers sacked by the immediate past administration in the State. He said that the State Government will support the establishment of the College of Medicine and Teaching Hospital for the RSUST as part of the pledge he made to the people of the state. Earlier, the Pro-Chancellor of the RSUST, Justice Iche Ndu commended Governor Wike for investing in the development of the university through development projects and programmes. He said the approval of the setting up of the College of Medicine and the approval of five hospitals for the take off of the Teaching Hospital for the university.